These inflatable relaxation stations are hitting the country in full-force. They are the perfect place to blow up under the trees at a campsite, in the backyard, or in the living room! 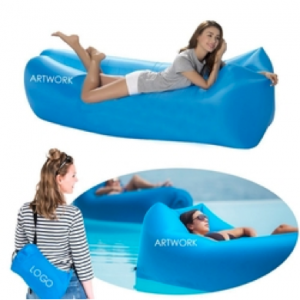 They also double up as a flotation device, or new wave raft to take out on a lake or in a swimming pool. Perfectly portable, these are the next best thing in summertime fun. Well under a hundred dollars apiece, these are a fun and enticing item for raffles and giveaways. They’re also incredibly enticing in a tradeshow booth as they’re a welcomed space to chill out at. The best part? You can brand them with your company name! The Promotional Times excels in finding the most exciting things to put in front of clients at any point in the year, with just the right lead time. To develop your own specialized newsletter and capitalize on your marketing budget, contact Jill ASAP.